Made from sustainable tagua nuts, this fruit-colored, Deco-style necklace adds movement and charm. Delicious colors and elemental Art Deco shapes come together in a playful pattern on Monica Farbiarz's elegant and fun necklace. Dyed a vibrant rainbow of shades and polished to a high gloss, the hand-carved beads are strung on silk cord with seed beeds for added texture. The beautiful beads are made from sustainable tagua nuts. Also known as "vegetable ivory," their grain is close and very hard like that of elephant tusks, but they come from a plentiful South American tree, not an endangered animal. The nuts fall to the ground when mature, so harvesting them does no harm to the tree. The colorful piece adds movement and charm to dresses, and a bright, stylish focal point to jeans and T-shirt. Handmade in Colombia. By 2007, she was ready to share her creations with the world, and now she's devoted to providing women with beautiful Tagua jewelry, all while helping her workers achieve their dreams. Although tagua does not bleed or fade, it is recommended that it be kept out of direct, prolonged sunlight. This is a very simple but pretty necklace, I think I would characterize it as funky but stylish (right up my alley!). 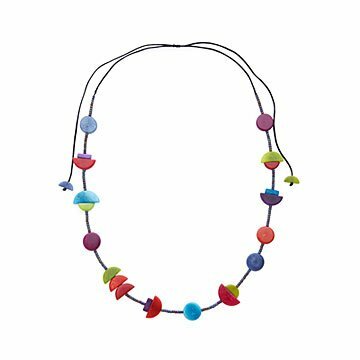 The Tagua beads are smooth and colorful, and are cut into cute shapes, and the necklace has a sliding clasp so it can be adjusted to any length. Very glad I treated myself.